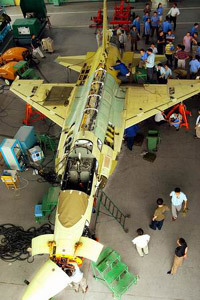 Originally known as Super-7, the FC-1 Xiaolong was developed by the Chengdu Aircraft Industry Corporation under a joint venture of China and Pakistan. The FC-1 is a lightweight multi-role fighter powered by a single Klimov RD-93 (derivative of the RD-33) turbofan. It is capable of beyond-visual-range (BVR) air-to-air combat, as well as laser-guided weapons delivery. Because the FC-1 has been developed primarily for the PAF and export market, it provides a low-cost replacement for many developing countries that are currently operating the ageing MiG-21/F-7 Fishbed and Northrop F-5 series. The unit price is estimated to be US$15 million. The origins of the 'Super-7' can be traced back to 1986 when Pakistan and China wanted to modernise the J-7 with western avionics and engine. The project was named 'Saber II' by the PAF and would replace its F-6s. In January 1987, Grumman Aerospace was seleted as primary contractor and several other western firms competed to provide the engine and avionics. By 1989 the projected costs had significantly increased (some sources say 40%) and was deemed a highly financial risk by the Pakistan Air Force. On top of that, Chinese relations with the west broke down. Subsequently the contract was cancelled. Chengdu continued the development under the new designation FC-1 (Fighter China-1) aimed at creating an affordable fighter for the export market. In 1995 Pakistan regained interest in a joint development with China. The 1993 US sanctions prevented the PAF from acquiring Western technology or weapons. In June 1999, China and Pakistan signed the joint development and production agreement to co-develop the FC-1. Chengdu was selected as primary contractor and the Russian Mikoyan Aero-Science Production Group (MASPG) was contracted to provide the Klimov RD-93 turbofan engine and design assistance too. The FC-1 design of today has little in common with the J-7 and is believed to be based on Mikoyan's concept for a single-engine fighter based on the MiG-29. The FC-1 also shows features from the F-16 design, although the layout is somewhat more conventional. In Pakistan the new fighter received the designation JF-17 (Joint Fighter-17) and is planned to replace the F-7, Mirage III/5 and Q-5. The Pakistan Air Force will probably be the biggest customer and thus is strongly involved in the development of the aircraft. However Chinese avionics were not meeting the PAF requirements and introducing Western avionics still proved to be a problem with the sanctions in place. It was not until the platform development and avionics system were de-coupled in early 2001, that the program started making progress. Also progressing was Chinese technology. 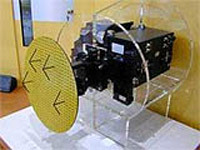 PAF agreed to the use of Chinese avionics, although it still have to made its mind up regarding the fire-control radar. The most likely contender being the Italian-built Grifo S7 radar, PAF F-7P, F-7PG and Mirages are also equipped with Grifo radars. The first FC-1 was rolled out on 31 May 2003. It made its first flight on 24 August 2003, although some say 2 or 3 September 2003. It was quickly followed by a second airframe (PT-2) for static tests and two more flying prototypes. The third prototype PT-3 has joined PT-1 in the flight testing program on 9 April 2004 and PT-4 is scheduled to fly later in 2005. PT-4 will be testing integration of the Chinese radar and PL-12/SD-10 BVR missile. The PAF has comitted to the acquisition of 150 JF-17, whilst China is expected to buy 250 for the PLAAF depending on the outcome of the evaluation. Pakistan will initially produce 50% of the aircraft locally, progressively increasing to 100%. Pakistan Aeronautical Complex (PAC) formally opened their JF-17 production facility at PAC Kamra factory on 6 April 2005. Production will start in 2005 and the first four locally-built aircraft will be handed over to the PAF in December 2006, another four will be delivered by March 2007. Full rate production is planned to start in 2007 turning out 20 aircraft per year. Earlier news reported 16 aircraft to be delivered in 2006, if this is still true, 12 will be produced by CAC of which four will be delivered to Pakistan. The initial production aircraft will probably feature a Chinese radar which would enable use of the Chinese BVR SD-10 missile. But Pakistan plans to put the Grifo radar in the initial production aircraft for evualuation and testing of the avionics with the Grifo. The Pakistan Air Force have offered the FC-1/JF-17 to the Royal Malaysian Air Force. China Aviation Import and Export Corporation (CATIC) and CAC are marketing the FC-1 to potential customers currently including Bangladesh, Egypt and Nigeria, more are likely to follow soon. Future variants will include a two-seat fully combat-capable training version, which is scheduled to begin flight testing in 2006. It features a lengthened fuselage to accomodate the additional cockpit. China may also develop its own powerplant for the FC-1, although it is also possible that the co-produced version of the Klimov RD-93, called the WS-13, will equip future FC-1s. Also there are plans to include air-to-air refuelling probes and modifications incorporating modern avionics. Pakistan is also looking at adding advanced Western weapons and avionics in the future. It is also looking at the possibility of acquiring anti-radiation missiles, which could be the same as the BVR missile with a different seeker head.